How to buy the best rolling backpack for kids? When the beginning of classes is looming, your child may be excited not only because he’ll see his friends soon, but also because it’s that time of the year again when he’ll get to have new things for school, such as new shoes and bags. Treat your child with something that he will treasure, and who knows, he might not want to buy a new one next year, saving you some cash. What he’ll probably like is a rolling backpack that is very versatile; it gives him the option to just pull it behind him, saving him the effort of having to carry it around. Apart from that, he is also saved from possible back and shoulder pains from having to carry too much heavy stuff. 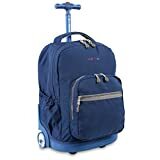 A rolling backpack is advised for kids who are bringing more than what they could carry, such as books for every subject, binders, and other school supplies. In short moments where he has to carry his bag, such as taking it up or down a few steps, or through a muddy path, he can use the shoulder straps attached with his bag, making it more efficient. If you’re convinced yet that you have to purchase a rolling backpack, see below for factors that should help you decide. 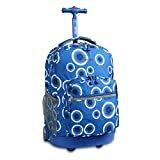 What are the factors to consider when purchasing rolling backpack for kids? Size: Bags come in a variety of sizes and shapes. To find the right one for your child, you need to determine how much your kid intends to put inside it. For example, if he’s going to use it for school, depending on what level he’s at, you might need more room for his books, notebooks, and other school stuff. It should also include snacks and packed lunch, as well as change of clothes. It’s also a great idea to get a roomy rolling backpack even if school stuff doesn’t require it; this is so you can use the bag for other occasions such as for travelling, camping, and sleepovers. This saves you the money of buying separate bags for all these activities. It’s roomy enough for all the stuff your child might need and all the things inside are easily accessible. It comes in different colors and designs so your child, boy or girl, will use it with pride. Design: Kids would love to have eye-catching items and this wouldn’t be an exemption when it comes to their rolling backpack. If you can, take your child with you when going shopping for bags so he can choose one that he really likes. This way, your child will treasure the bag and not fall out of love after only a few months’ use. If he loves it so much, he may use it for another year, and so on, helping you save some cash for more important purchases. Everyone knows that majority of boys love everything about planes and jets, most especially this rolling backpack that even has jet liner wings. The front of the bag resembles a NASA space shuttle, giving your son an added boost of confidence. Especially if they love all things cute and pink. It comes in three designs that has cute applique in the fronts and sides. Choose from Butterfly, Ladybug, and Owl. The material is made of matte vinyl that can be spot-cleaned with a damp cloth. It’s perfect for kids as it can resist spills, food stains, and dirt. Purpose: As mentioned with the size, you’ll want to get a rolling backpack for your child that will cater to his varying activities, be it schooling, travelling, or camping. This may be a bit big if used only for a day’s visit to his grandparents; for this, consider getting a smaller backpack that will be enough for snacks and a change of clothes. Adorable pink horse stuffed animal comes out as an extra toy! Makes a great companion or a special friend for your child! Made with high quality plush fabric! Ultra soft, cuddly, and snuggly, your child will grow so attached he or she can never go anywhere without it! Perfect use for school, travel luggage, pool, gym, or overnight at grandma's! Your child will be the center of attention! This bag is super cute and it is made of soft material perfect for kids and toddlers. The telescoping handling for the wheels can be removed so that it can be easily transformed into a backpack. Comfort: When carried as a backpack, the rolling bag may have provisions for the handle to be removed so that it won’t be a bother when worn over the shoulder. This makes it more comfortable for the child and definitely much lighter. This type of transforming bag is good if you like to have some sort of a two-in-one bag that can be filled with school items, or used for a light afternoon picnic. If the handles can’t be taken out, find one that has thick covering for the metal. This is to ensure that the hard metal part won’t rub against the back of your child. Also, if you foresee that your child will often use it as a backpack rather than a rolling luggage, ensure that the straps are made of comfortable materials, and are padded to give more support. Whether you’re getting a rolling backpack for your child for school or travel purposes, make sure to get the best one suited to his needs. The basic things you should look at are: if it is enough to fit all the stuff he needs, if it’s designed the way he likes, and if it’s comfortable enough to be worn on his shoulders when needed. Apart from these, also invest something that would last years of usage (or at least a school year) to save you money in the long run. Kids can be quite unforgiving when it comes to caring about their belongings, so the parents should mind it for them.